Couch to 5K is back! 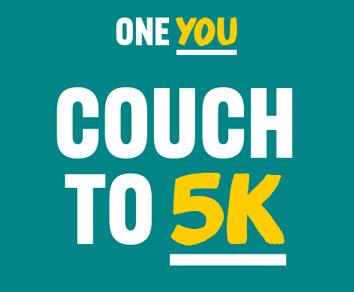 BBC Sport’s Get Inspired has teamed up with Public Health England’s One You campaign to re-launch the popular Couch to 5K app which has been created to help anyone go from the couch to running 5K in only 9 weeks! The One You Couch to 5K app guides people through a 9 week programme by encouraging them to run three times a week. This helps people to increase the distance they run little by little so that by the time they arrive at week 9 they are encouraged to run for half an hour, which is approximately 5k. If you download the One You Couch to 5K app you can choose your trainer from radio DJ Jo Whiley, comedian and actor Sanjeev Kohli, Olympic gold medallist Michael Johnson, comedian Sarah Millican or Laura Hamzic who used the app herself to get running. Each of these trainers help to keep you motivated as you work through the 9 week running course at your own pace. If you don’t have a smartphone, but would still like to follow the Couch to 5K programme then you can follow the Couch to 5k instructions on the NHS Choices website. Visit our Move More page to download the Couch to 5k app for FREE and get running! Our Move More page also has details of local running opportunities in Hounslow. « Nutrition on the Go!